Jim was in High school 1980 when he heard there was a contest in San Diego, and you could win a surfboard and it was free to enter. He went Sean and Brian McNulty's house, got them up to go surf in it. Little did they know it was a tryout to get on G&S Team and the top four would make it. Jim won, with Sean and Brian getting second and third. 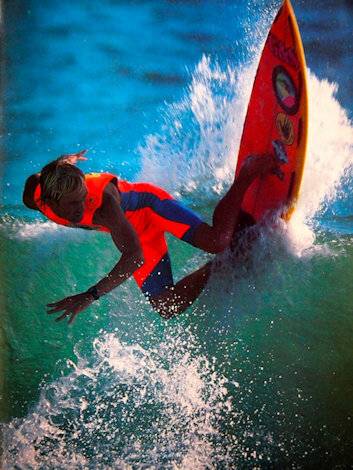 He then went on to win the NSSA Season 1983, right onto the World Tour, winning a world longboard title. He rode for Larry Gordon at Gordon & Smith for the next 10 years. 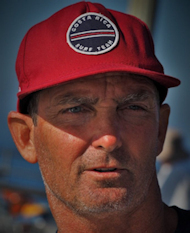 In recent years Jim has a surf school in Costa Rica and spends a lot of time coaching up and coming champion surfers from there. Mike Moir took the bottom picture of Jim in October 2018 during the ISA Juniors World Comp in Huntington Beach.